Good news World of Warcraft players! Patch 4.0.3a aka “The Shattering” is live and playable on the PTR, and should be coming to the real world of Azeroth sometime next week, rumors suggest. 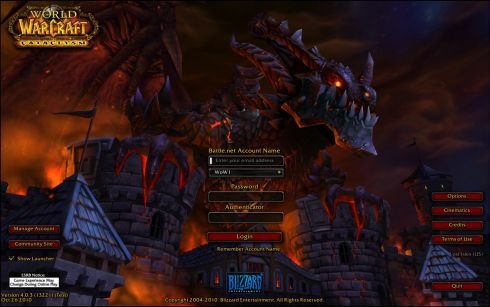 MMO-Champion and WoW Joystiq both confirm that the world has been sundered by Deathwing and it even comes with that beautiful new login screen we have all been waiting for. What’s more interesting, is that the PTR patch is already labeled as “release,” but with PTR folks in the know, comes the speculation — when will “The Shattering” come? Don’t get your hopes up, but it is definitely possible that patch 4.0.3a could be dropping as early as next maintenance (Tuesday, November 23). We have a slight incling of this from Blizzard themselves who say that the elemental invasion is progressing faster than we thought. The most likely situation however, is that it will drop the week prior to the Cataclysm launch which would be November 30, giving players a whole seven days to experience the new/old world along with the new class combinations and changes. I don’t know about you, but I can’t wait to make a troll druid. What content can’t you wait to get your hands on once “The Shattering” hits? How much fun would it be to have a Starcraft MMORPG?